We have found many math-themed books over the past years. Here are a few of our favorites: Tasha Tudor is one of my favorite author-illustrators. 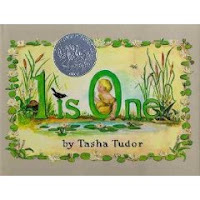 1 is One is a very beautiful beginning counting book. 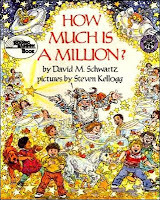 How Much is a Million, by David Schwartz, helps children and parents alike to visualize that huge number. 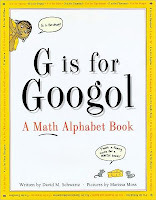 My fourth-grader loves G is for Googol: A Math Alphabet Book. Every letter describes a math concept--some of them fairly advanced--and my son soaked it all in, and then taught bits of it to his little siblings. They love to astound strangers with this one: "How much is 10 to the power of 10 to the power of 100?" (Stunned look from innocent adult.) "Googol!" 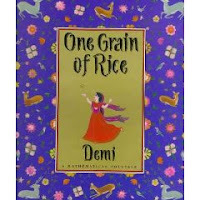 One Grain of Rice, by the always excellent Demi, relates a clever story that uses math to teach doubles. Even if the concept is over their heads, the art is too gorgeous to miss. We also like to check out Stuart Murphy's books when we go to the library. He has written many short picture books that weave basic math principles into a simple story. Some are better than others, and all have kooky, cartoon-ish illustrations; still, our favorites include Henry the Fourth and House for Birdie.